Telling the Development Bank of Southern Africa to publicly commit to not funding the Thabametsi coal powered plant. The impacts of climate change are being felt in South Africa today more than ever, and developing another power plant in a water-stressed region stands to threaten communities living in Lephalale. In order to avoid catastrophic climate change, no new coal infrastructure should be built. While we welcome the Development Bank’s investments in renewable energy initiatives, these positive steps risk being undermined by support for coal infrastructure. Instead, DBSA can play a bigger role in scaling up action on climate change and delivering on the ambitions that South Africa committed to during the global climate talks held in Paris in 2015. 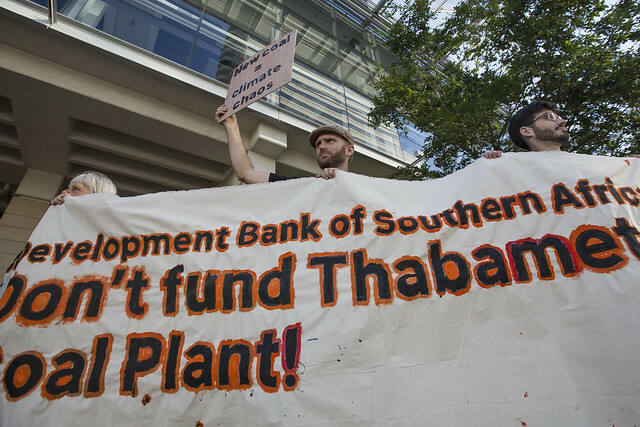 350Africa is calling on the Development Bank of Southern Africa (DBSA) to publically commit to not funding Thabametsi coal-fired power station. The Life After Coal campaign has made great strides towards stopping Thabametsi and other coal-fired power station projects from going ahead, and we are joining this struggle, focusing on the institutions financing Thabametsi. Emissions from Thabametsi are going to be far worse than Eskom’s newest coal-fired power stations, Medupi and Kusile, and even worse than some of the country’s older power plants. Thabametsi should not even be considered because it uses some of the most polluting coal-burning technologies, with a contribution to climate change to match. What is worse, is that the effects of coal on many South Africans are insurmountable. Poor health, conflict, broken homes are but some of the effects of coal. While we applaud the DBSA’s backing of renewable energy initiatives in South Africa, these positive steps run the risk of being undermined by pouring money into projects like Thabametsi. Renewable energy like wind and solar is not only cleaner but cheaper. Renewable energy works. We’re calling for a shift in South Africa’s energy system and that begins with putting a stop to plans for any new coal infrastructure. This May, your petition will be delivered to the DBSA as part of a wider regional movement for a coal-free Africa. Thank you for signing this petition to the Development Bank of South Africa. 350Africa is calling on the Development Bank of Southern Africa (DBSA) to publically commit to not funding Thabametsi coal-fired power station. The impacts of climate change are being felt in South Africa today more than ever, and developing another power plant in a water-stressed region stands to threaten communities living in Lephalale. In order to avoid catastrophic climate change, no new coal infrastructure should be built. While we welcome the Development Bank’s investments in renewable energy initiatives, these positive steps risk being undermined by support for coal infrastructure. Instead, DBSA can play a bigger role in scaling up action on climate change and delivering on the ambitions that South Africa committed to during the global climate talks held in Paris in 2015. The Life After Coal campaign has made great strides towards stopping Thabametsi and other coal-fired power station projects from going ahead, and we are joining this struggle, focusing on the institutions financing Thabametsi. We’re calling on the DBSA to commit to not financing Thabametsi coal-fired power plant. It is an opportunity for them to stand out and be a leader amongst financiers in South Africa, and not waiver from fulfilling their development aims of improving affordable energy access for all South Africans. Add your name to this petition! Compared to a least-cost energy system that combine wind, solar, and gas, the inclusion of new coal plants in South Africa’s energy future is set to cost the country’s electricity consumers an additional R19.68 billion. This figure could be better invested building South Africa’s economy, social protection systems and a just transition pathway. On Tuesday, 11th of December, together with a group of individuals and activists from various partner organisations including Project 90 by 2030, The Green Anglicans, and Fossil Free South Africa gathered outside the Energy Week South Africa summit at the Westin Hotel, in Cape Town calling on the Development Bank of Southern Africa (DBSA) to not fund the Thabametsi coal fired power station. Following years of portraying themselves as a green bank, Nedbank has demonstrated their willingness to Make Change Happen and address climate risks by withdrawing from financing Thabametsi and Khanyisa, two proposed coal fired power plants that form part of governments Coal Independent Power Producer Program (CIPPP). Supply Security: The low electricity demand in South Africa is forecast to continue, and renders the coal IPPs, namely Thabametsi and Khanyisa unnecessary to meet the projected short, medium, and long term demand. Cost Implications of Coal IPPs: The inclusion of the two preferred coal IPPs (Thabametsi and Khanyisa) in South Africa’s electricity plan would increase the system cost by R19.68 billion, and Thabametsi alone would cost the public R12.57 billion through higher electricity tariffs. Water Security: The Thabametsi power plant is planned for development in a water-stressed region, where the Department of Water and Sanitation rated water security as ‘high risk’ because supply only just meets demand, and demand is anticipated to exceed supply in the near future under current circumstances. Emissions lock-in: The GHG lock-in from Thabametsi plant will impact on South Africa’s ability to meet its long-term climate change commitments, and will make it more difficult and expensive to meet commitments, as significant GHG emission reductions will be required in other sectors where mitigation is more difficult.